Mark Twain wasn't writing about the gold market when he made his famous quote about historical recurrence, but he could have been, as the gold market has been "rhyming" every 21 months. Every 21 months there has been a major peak in the gold market, going back to the start of this bull market, over 13 years ago. Gold is now 8 months from the next scheduled 21-month peak, which should arrive in July 2013. 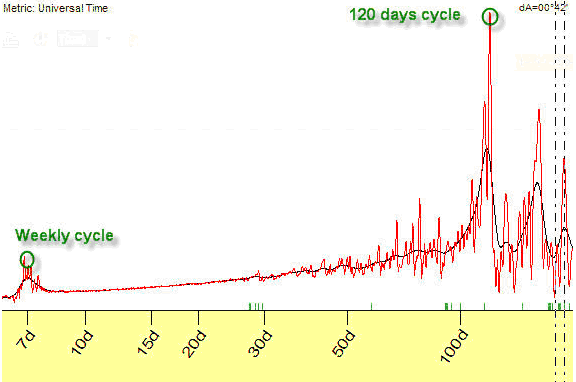 The gains in each cycle have ranged between 80% and 97%, from the low of each cycle up to the top. This is surprisingly little variation, at least as far as financial markets are concerned. This is about as steady as it ever gets. 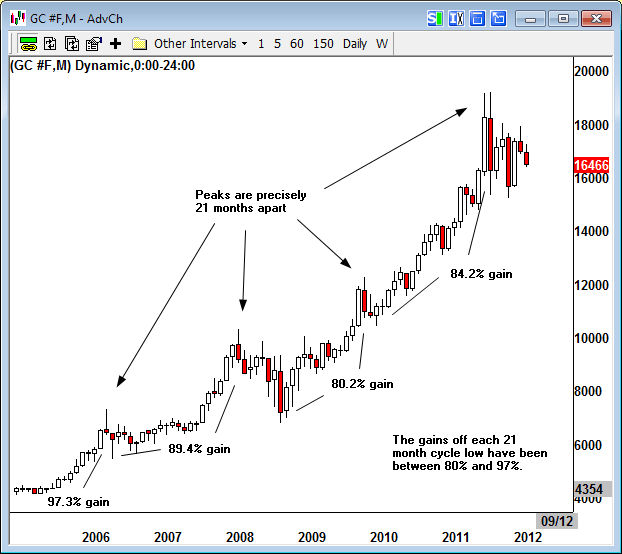 If it happens again, gold will be around $2,700 in mid-2013. So far this particular 21-month cycle is tracking well, as gold is primed and ready for launch into the final major growth phase. This chart shows the monthly fractal dimension of the gold market, which is a specific measurement of the linearity of a price pattern. Essentially it is telling us whether a market's movements more resemble a line, with prices moving from Point A to Point B (fractal dimension of 1), or whether the movements are more haphazard, with the movement more resembling a plane (fractal dimension of 2). Although not a lot of people stop to think about it, when we enter a market we are attempting to capture just this type of linear movement, with a market moving from our entry at Point A to a profitable exit at Point B. This is where the fractal dimension comes in, to let us know when the probabilities of capturing such a move are in our favor, and also when the linearity of a trend is "maxed out." It's very valuable information. 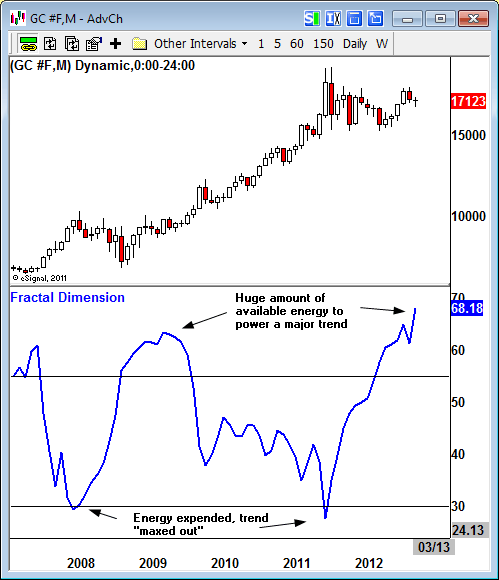 When the fractal dimension of a market is high, it is loaded with available energy and ready for a major trend. Right now the fractal dimension of the monthly gold chart is as high as it's been during the entire bull market, meaning there is more energy now embedded within the pattern to power a strong trend than at any other time in the past 13 years. An 80%+ rally is definitely within reasonable expectations for this cycle. There are specific reasons why the number 21 is so important in market cycles, having to do with the fractal nature of financial markets. Something is fractal when it is self-similar in all sizes and time-frames -when the small parts look like the big parts. The patterns are the same at every scale. A fractal system is therefore governed by scaling factors, and in markets these scaling factors describe the way prices expand and contract. But here's where it gets really interesting: time in markets also scales according to fractal patterns. 86.6 is the universal scaling factor for time in markets. I realize you have to take my word on this in such a short article, but it's not a coincidence that the human life span is 86.6 years, as we are also governed by this cycle. One-quarter of 86.6 is 21.65, which is why the drinking age is 21, and also why the retirement age is 65 years, the ¾ point of our human cycle. Fortunately you don't have to just accept my word that the gold market is organized along this 86.6-based fractal time scale. The chart below shows a spectrum analysis of the cycles in the gold market, performed by a clever left-brained individual named Sergey Tassarov back in 2007. 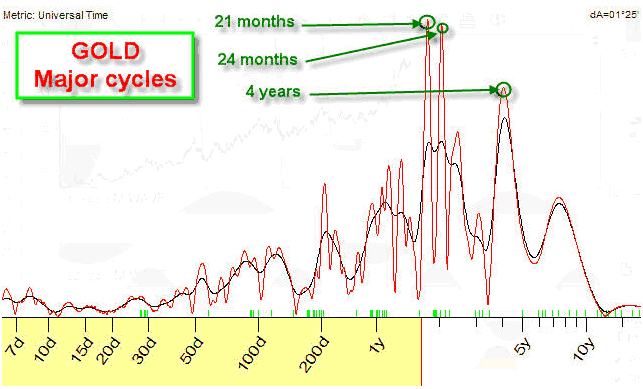 In my opinion, the other cycles identified here are harmonics of the dominant 21-month cycle, similar to the way in which musical notes have overtones. If we delve deeper into this spectrum analysis, we see that in the shorter-term there is a dominant 120 day cycle in the gold market. And here's where we get to the clincher: 120 trading days (4 calendar months) works out to precisely 86 trading days. It is this 86 day cycle that adds up to form 21-month cycles, on up to bigger yearly cycles, such as the 17.32 year cycle that is common in commodity markets. In the other direction, this cycle can be found all the way down to the minutes and seconds. That's how fractal systems work. So the bottom line is there is a dominant 21-month cycle in the gold market, which continues to track well, with a scheduled peak arriving in mid-2013. If you are interested in more details, I have written a lengthy Special Report describing these cycles and patterns, available to annual subscribers to the Fractal Gold Report. A 30-day free trial is also available.